This is certainly the season to be jolly and this time, Santa Claus is not coming on a Sleigh. He is using Uber. Slum2School is teaming up with Uber Lagos in its ‘Christmas in a Box‘ campaign to provide beautifully wrapped Christmas presents to 10,000 disadvantaged and vulnerable children in Nigeria. Under the “Christmas in a Box” campaign, Slum2School is encouraging people to gift items in boxes to the less privileged in the society. So on Thursday 17th & Friday 18th December with the touch of a button, a driver will come round to your office or home to pick up your donated gift boxes and deliver them directly to Slum2school depots in Lagos – all for free! Slum2school is a non-profit initiative focused on providing hope for every child. Their vision is to transform the society by empowering disadvantaged children to realise their full potential. Spread the word at your home or office, and collect goodies for your gift boxes! Boxes should be wrapped and labelled. Signup here if you are not yet an Uber user. 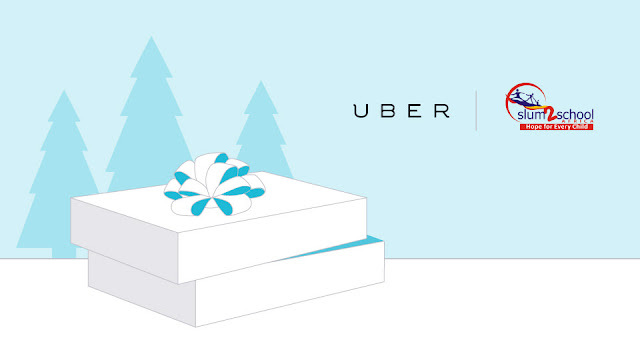 Open your Uber app on Thursday 17th and Friday 18th December between 10:00 – 16:00. Select the ‘Slum2school’ vehicle option at the bottom of the screen. If connected, an Uber will arrive to pick up your gift box and drop off at Slum2school depots free of charge. Please keep in mind drivers can’t leave vehicles unattended, so we ask that you bring your items out to meet your driver when they arrive. You’re playing Santa to the children so please take care in putting your gift box together! Here’s the list of approved items you can contribute: toys, clothes, shoes, story books, lego, snacks, games, and generally non-perishable items. If you are unable to request a #Slum2school vehicle on both days, you can drop off your Christmas boxes on Saturday 19th December at Makoko Primary school, Yaba.